FORT LAUDERDALE, Fla. – Democrats are still celebrating Andrew Gillum’s historic win on August 28, when the 39year old mayor of Tallahassee became Florida’s first black gubernatorial nominee of any major party. With a stunning come-from-behind victory, Gillum clinched the Democratic primary with a last-minute surge that put him over the top in the race to become Florida’s next governor. Political pundits are still analyzing his monumental upset in the Democratic Party, as he beat out opponents with far more money and/or name recognition. He beat out four other opponents, all of whom had significantly more campaign funding. “Money doesn’t vote, people do,” he said. Jeff Greene, a billionaire, came in fourth place. Gwen Graham, daughter of former Florida governor Bob Graham, had been leading the group much of the election cycle. She came in second, while Philip Levine, former mayor of Miami Beach, came in third. Chris King came in fifth place. Graham, Levine and Greene had TV ads running round the clock. Gillum now faces what is expected to be a fierce battle against Donald Trump-backed candidate Ron DeSantis in November. Gillum, who has the support of Bernie Sanders, said he is energized and ready for the fight. “We’re going to unite this state in such a way that is unparalleled in the state of Florida. The dark days coming out of Washington and the division coming out of the White House, we’re going to remind this country that we can be united,” Gillum said. 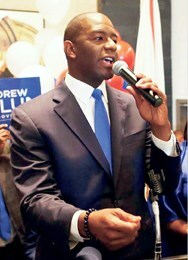 Gillum is a one-of-a-kind candidate who can garner the vote from all races and ethnicities. “For anyone who thinks Gillum can only get the black vote, you’re wrong,” Jones said on CNN Tuesday night. Gillum said he now understands what his grandmother meant when he was younger. Among some of his campaign promises are criminal justice reform, a living wage and increased pay for teachers. He said he’s also committed to establishing a living wage. Graham say they’ve asked their supporters to back Gillum; who said King has pledged his support as well. Included in his thanks were supporters from his alma mater, Florida A & M University. “My FAMU family has held me,” said Gillum. He is expecting to prevail in November.